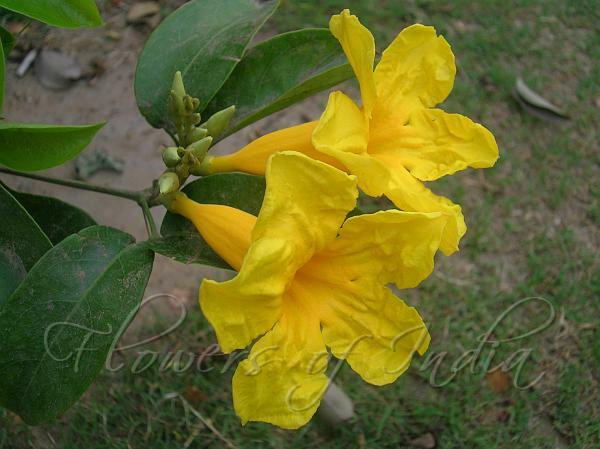 Native to Brazil, Yellow Trumpet Vine is a beautiful creeper with bright yellow trumpet shaped flowers and glossy leaves. Each individual plant had a single inflorescence, which extended above the foliage, in the form of a simple, terminal, vertically orientated, many-flowered raceme on a long, bracteose peduncle. The inflorescence structure, with only one or two flowers open at a given time, indicates continuous flowering over at least several weeks, thus displaying a steady state pattern . The flowers, on a stout pedicel (20 mm long), have a 5-dentate tubular calyx. The calyx, the subtending bracts and the two prophylls bear groups of extrafloral nectaries (single peltate trichomes) These were foraged by large, blackish ants day and night. The yellow-coloured corolla, measuring 7 mm in length, has a 28mm long and 4mm-wide basal tube that widens rather abruptly into a campanulate limb. 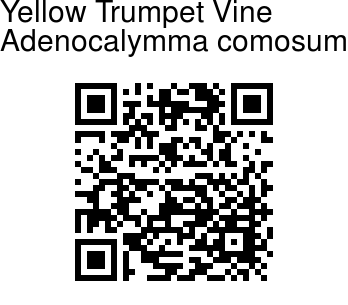 Yellow Trumpet Vine is native to Brazil. Photographed in India International Centre, Delh.